Matteo Ciardonei is my paternal great grandfather. 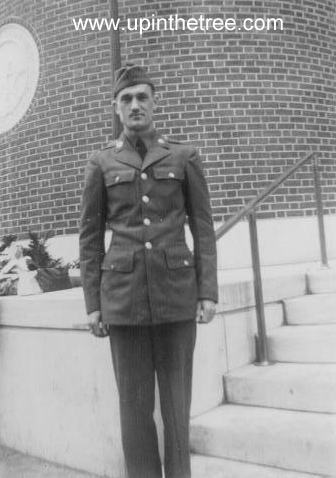 He came to the United States March 22, 1920 with my grandfather. Matteo was hospitalized upon arrival. My grandfather, Matteo’s son, was released from detention when his aunt picked him up on March 31st. Sadly, Matteo was deported and left the United States on April 12th due to a tuberculosis diagnosis. Matteo passed way less than one year later on March 14, 1921 in his hometown of Cossano Canavese, Turino, Italy. 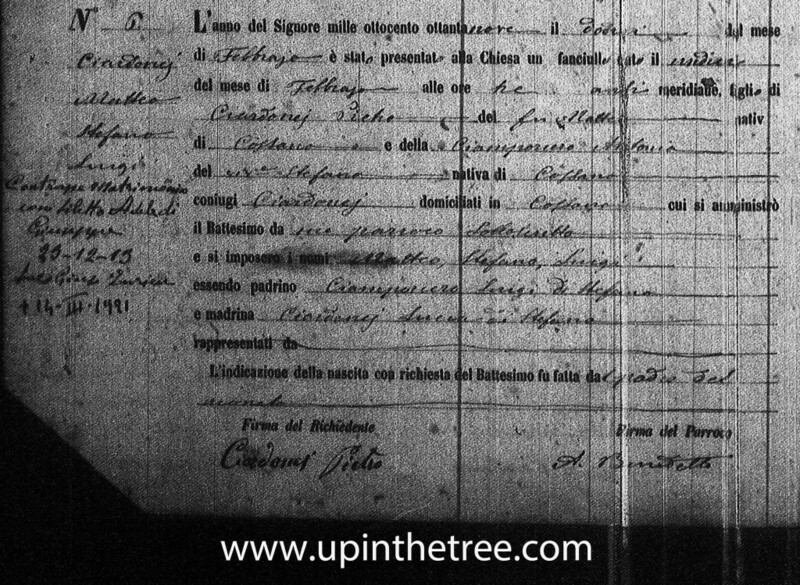 I am so lucky that FamilySearch has a microfilm from the village of Cossano Canavese. I have been able to reconstruct my paternal Italian line using baptism, marriage, and death records. With some family members, I was fortunate that the priest went back to the baptism record and recorded notes about the marriage and death for that person. Pietro Ciardonei and Antonia Ciamporcero are my paternal great-great-grandparents. They lived their entire lives in Cossano Canavese, Piedmonte, Italy. This is a small town outside of Turin in the foothills of the Alps. Pietro was born about 1845. Antonia was born 4 February 1859. They married on 20 March 1872. Their marriage produced at least 7 children. Three of their first four children died before reaching the age of three. My great grandfather was the first son to survive childhood. I can only imagine what difficult times Pietro and Antonia faced losing so many children so young at the start of their marriage. 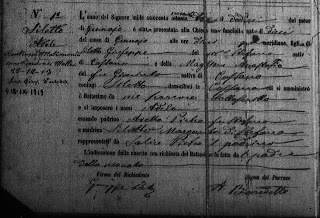 I have been able to research my Italian ancestors because Family Search has a microfilm that contains the church records from their small town. 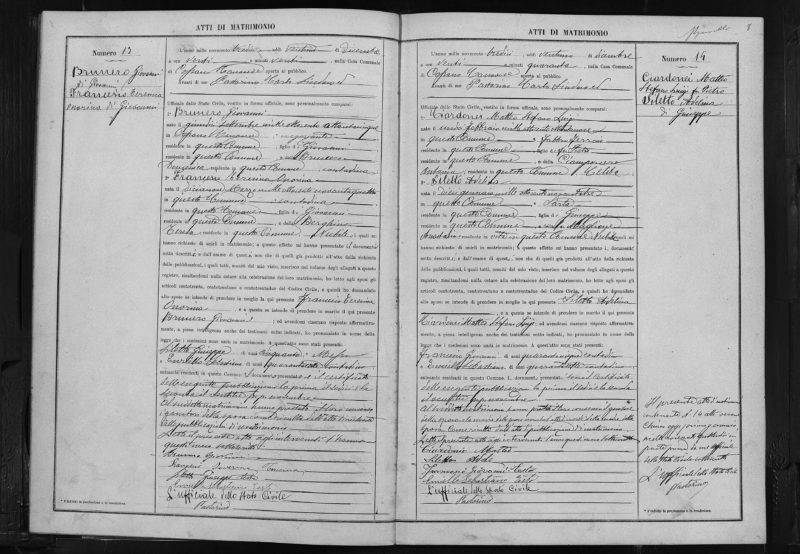 Below is a digital copy of Pietro and Antonia’s marriage record. The year one thousand eight hundred seventy two the 20thof March of publications made in the church of St. Stefano, dispenses ??? presented to the parish priests ?? 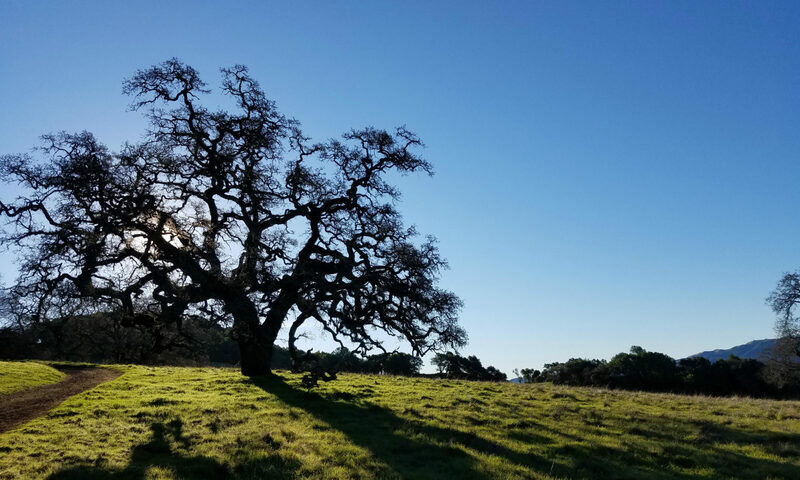 Marrying according to the rite of S. ?? Ciardonei Pietro, twenty seven, native of Cossano, living in Cossano, son of the deceased Matteo, son of the late Domenico and son of the living Avetta Lucia, daughter of the deceased Antonio. And Ciamporcero Antonia, twenty three, native of Cossano, living in Cossano, daughter of the living Stefano, son of the deceased Domenico, and daughter of the living Ciardonei Maria, daughter of the deceased Stefano. (2Matteo + 2Lucia) – Pietro(Teresa/Antonia) = ?!?! I have jumped deep into researching my Italian line the last couple of months. 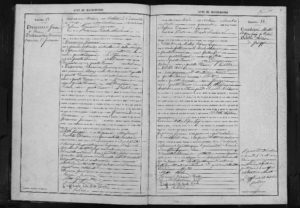 I have been slowly combing my way through baptism, marriage, and death records to piece together my family line. I am still working on these records but want to share an interesting story of analysis of a portion of my goldmine. I warn you now that everyone has the same name. Proceed with caution! 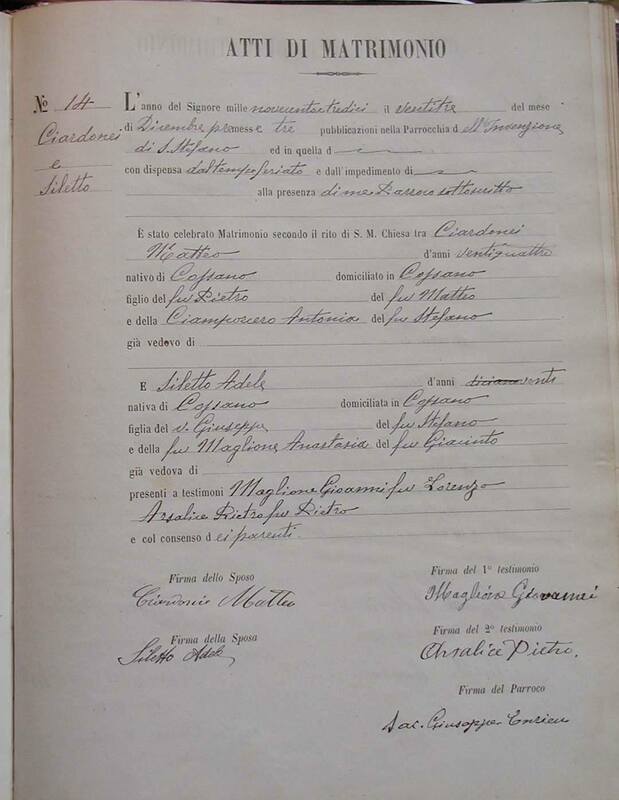 There was also a baptism record for a Matteo Claudio Ciardonei born 8 November 1875 to Pietro Ciardonei and Teresa Salarano. My first inclination was to think that this was a first marriage for Pietro. I next went on to find the marriage records for Pietro & Antonia and Pietro & Teresa. A quick glance had me thinking that these were the same person. When I arrived home and analyzed the documents a few days later, I was not so sure. 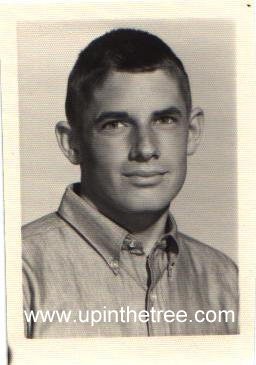 The only thing that was for sure – I was immediately thankful that almost all of the church records listed a person’s father, his father, and sometimes the person’s mother and her father. In addition each name indicated if the person was alive or deceased. Pietro Ciardonei married Teresa Salarano on 20 February 1875. Pietro is listed as the son of living Matteo (who is the son of deceased Pietro) and deceased Lucia Avetta (daughter of living Sebastiano). Teresa parents are listed as deceased Stefano and living Maria Bonello. 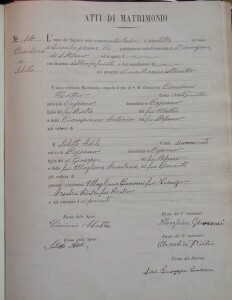 Pietro Ciardonei married Antonia Ciamporcero on 20 March 1882. 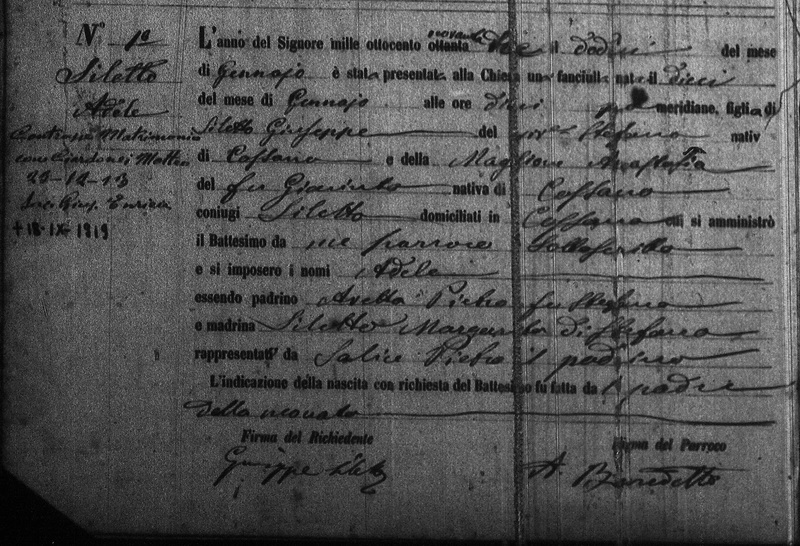 I was surprised to see that Pietro’s parents were slightly different than the prior marriage record to Teresea. This Pietro’s parents are deceased Matteo (son of deceased Domenico) and living Lucia Avetta (daughter of deceased Antonio). Are these the same Pietro Ciardonei? It was time to go back another generation to try to find out. 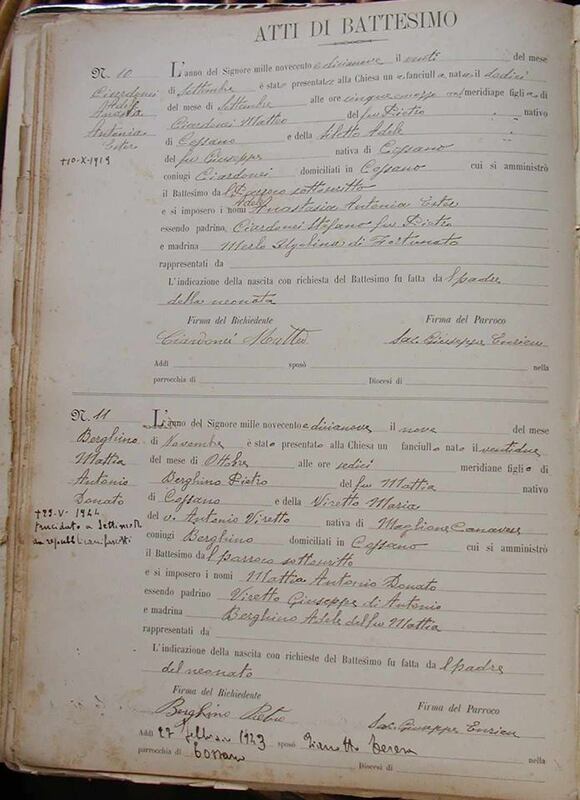 I went on to note that Lucia Avetta’s parents were listed as living Sebastiano Avetta (son of deceased Matteo) and living Maria Franesio (daughter of deceased Michele). I needed another trip back to the library. 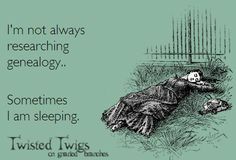 On my next trip I quickly made my way back to the marriage records and started searching before 1846. To my surprise, I found another marriage certificate for Matteo Ciardonei. This time he was marrying Lucia Avetta in 1835. Okay, now I was totally confused. This town was Catholic to their last breath. How is it that Matteo Ciardonei married Lucia Avetta twice?! 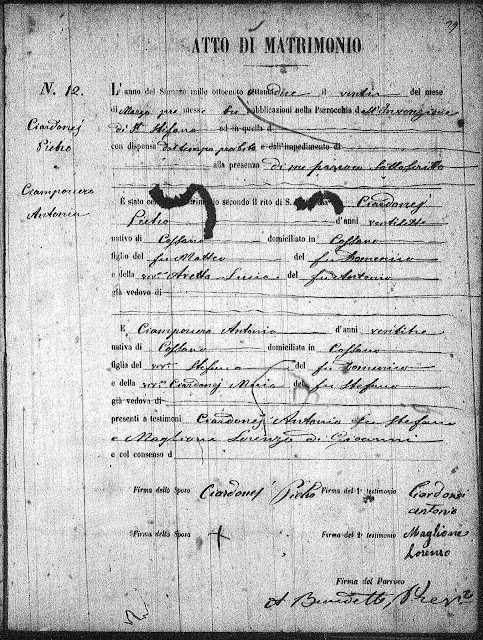 The 1835 marriage of Matteo Ciardonei to Lucia Avetta is a handwritten marriage record. Although I have been unable to translate the whole thing yet due to a change of language from Italian to Latin, I can definitely see the names written in the paragraph. Matteo’s parents are listed as Domenico Ciardonei and Maria Giandefio. 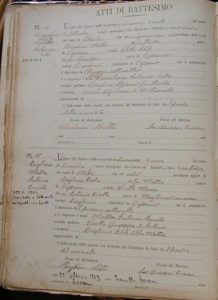 Lucia Avetta’s parents are listed as Antonio Avetta and Magdelena Giacometto (daughter of Ignatio). 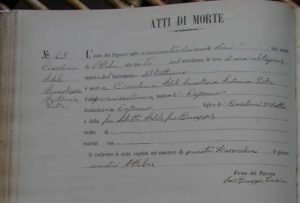 I also came upon a death record for Lucia Ciardonei ne Avetta. She died 17 July 1888. The death record states that she was 74 at the time of her death. This would give an estimated birthdate about 1813-1815. Her parents are listed as Antonio and Magdelena. The spouse is listed as Matteo Ciardonei. It was time to compile an excel sheet to figure out just what I had here. My excel sheet included columns for date, record type, name, name of father, father’s father, mother, mother’s fathers, spouse, and estimated birthdate. After entering all baptism records, marriage records, and death records the families started to shake out. Once on paper it became clear that Lucia Avetta in the 1835 and 1846 marriage licenses was the key to unraveling this mystery. Each marriage definitely had a different Lucia (different parents). I had two different Matteo Ciardonei’s marrying two different Lucia Avetta’s only 11 years apart. Both of these couples had at least one son named Pietro. Both Pietro’s had sons named Matteo (about eight years apart). 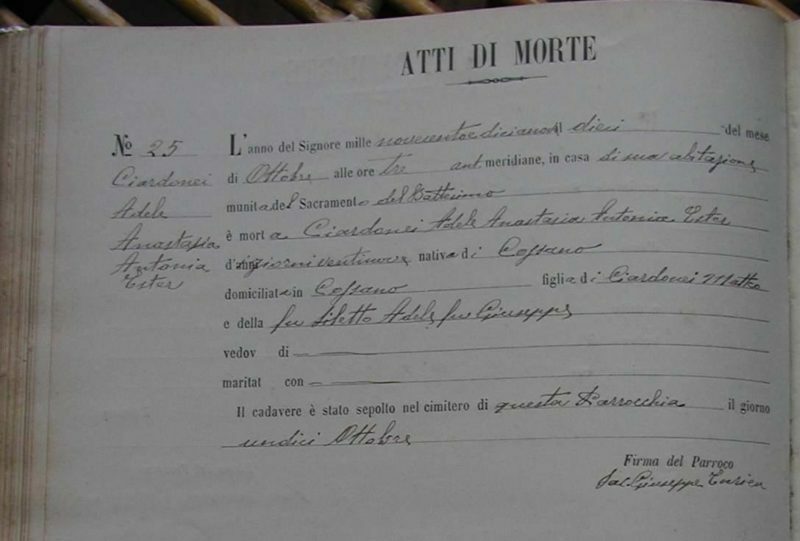 The death record for Lucia Ciardonei ne Avetta helped to solidify my argument for which Matteo and Lucia marriage was mine. If you look back to the marriage certificates for Pietro & Teresa and Pietro & Antonia, you will notice that one Lucia is living while the other is already deceased. “My” Lucia (daughter of Antonio and Magdelena) is listed as living. This jives with Lucia’s death in 1888. The “other” Lucia passed away before 1875.